A DAY AFTER Narmada water pumped from Dholidhaja dam through a SAUNI pipeline reached Aji-I dam, Rajkot mayor and other local BJP leaders visited Aji dam and formally welcomed the Narmada water to the local reservoir on Monday. This is for the second time in three months that Narmada water is being pumped in the Aji-I dam for meeting drinking water needs of the city. After the Rajkot Municipal Corporation (RMC) approached the state government with a request to pump more water in Aji-I dam to meet drinking water requirement during summer, the state irrigation department had started pumping water from Dholidhaja dam in Surendranagar to Aji-I dam via link-III of SAUNI (Saurashtra Narmada Avataran Irrigation) Yojana from the beginning of this month. “We are drawing around 150 million litres water per day (MLD) from Aji for supplying to city residents. But water level in the dam had dipped to 14.5 feet only. On the other hand, Nyari-I dam too has storage, which can last only till the end of April. As a precautionary measure, we requested the state government to pump 600 million cubic feet (mcft) more Narmada water. The government granted our request and the water has started flowing in Aji dam,” Rajkot municipal commissioner Banchhanidhi Pani told The Indian Express on Monday. This is the second time in three months that Narmada water is being pumped into Aji-I dam. The irrigation department had pumped 450 mcft water into the Aji-dam in October and November as the water level was very low following very little rainfall in its catchment area. Aji-I is the single largest local source of water for Rajkot. RMC distributes 300 MLD water to 15 lakh residents of the city every day. Aji-I, Nyari-I and Bhardar dams are the local sources. The RMC draws 115 MLD from Aji, 50 MLD from Nyari-I dam, 40 MLD from Bhadar dam. The Balance 100 MLD comes through pipelines supplying Narmada water at Nyara, Bedi and Kothariya. Civic officers said that they are planning to draw more water from Aji-I now that Narmada water has started flowing in it. “We want to preserve Nyari-I for the summer and therefore, we shall draw around 150 MLD from Aji-I while reducing drawal from Nyari-I,” the municipal commissioner added. Officers in Rajkot irrigation circle said that they would operate the link-II for around 45 days to pump 600 mcft (1 mcft =28.31 MLD) water to Aji-I. “If we get 600 mcft for Aji-I, it will be sufficient to supply to the city till end of July,” Pani added. Meanwhile, the irrigation department is also pumping water in Aji-III dam located in Padadhari taluka of Rajkot but which is a source of drinking water for Jamnagar city. “We have been pumping water into the Aji-II dam from January 2 by operating link-I of SAUNI. 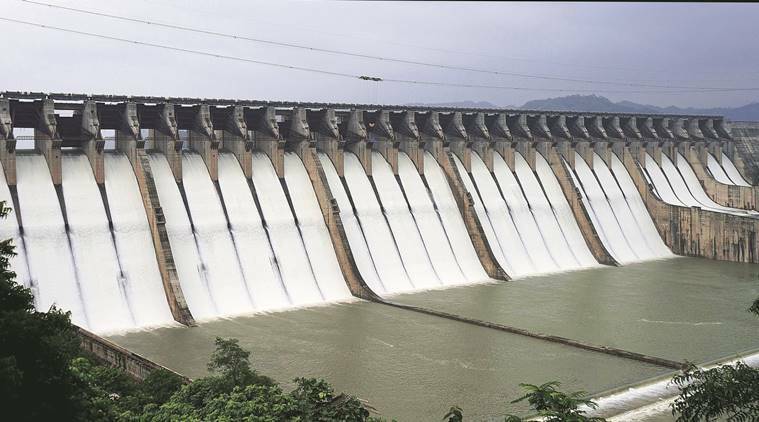 Presently, the Sardar Sarovar Narmada Nigam Limited (SSNNL) is discharging 1,400 cubic feet per second in Morbi branch canal,” said Pankaj Sonpal, executive engineer of SAUNI for Rajkot division.